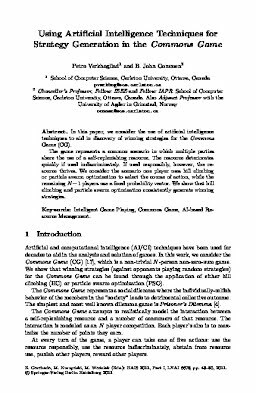 In this paper, we consider the use of artificial intelligence techniques to aid in discovery of winning strategies for the Commons Game (CG). The game represents a common scenario in which multiple parties share the use of a self-replenishing resource. The resource deteriorates quickly if used indiscriminately. If used responsibly, however, the resource thrives. We consider the scenario one player uses hill climbing or particle swarm optimization to select the course of action, while the remaining N − 1 players use a fixed probability vector. We show that hill climbing and particle swarm optimization consistently generate winning strategies.